Often considered the most practical member of the blinds family, metal venetian blinds have heaps of inherent benefits built in as standard. Aluminium blinds bring both style and functionality in an easy to clean water resistant and flexible design, meaning they are great for any kitchen or bathroom window, as well as any other room of the home of office. Available to buy online in a wide variety of fabulous colours from matt black to gloss white and of course contemporary metallic or chrome finishes. 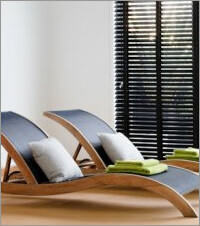 We also have a fabulous collection of wood effect venetians or real wood blinds all FSC approved. We don’t do anything cheap except for our prices so you can rest assured our luxury blinds are of the highest quality, and being custom made to measure blinds they will fit your measurements precisely offering you greater control of just how much sunlight gets in through your windows. 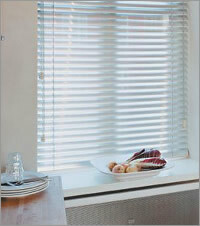 Simply tilt the slats of the blinds to angle the light where you need it in the room. With their simple, clean and elegant lines our 25mm metal blinds have been a firm favourite with interior designers and demanding high end functional applications for many years. They are commonly seen in schools, homes, offices, hospitals and conservatories. These functional blinds come in almost every colour, finish and style imaginable and are available in extra wide sizes and extra-long drops for larger windows. Choosing one of our made to measure venetian blinds means you will receive a product that is individually manufactured in the UK to your sizes, totally bespoke and complying with ISO standards. 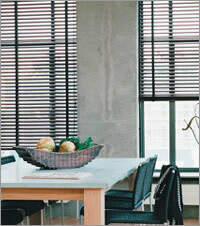 All our venetians come with heavy duty tilt rods and long life bevel tilt gears. 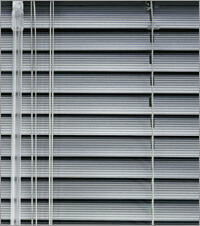 With crash proof cord locks and colour matched head rails, cords and ladder tapes to create a very high quality blind. 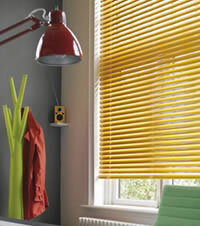 Our website is easy to use and not only the best place to buy venetian blinds online, but also conservatory blinds, as our quality blinds are made from high grade aluminium which is designed to be efficient in controlling hot or sunny environments and are superior in everyday usage when compared to the mass produced cheap plastic blinds available elsewhere. 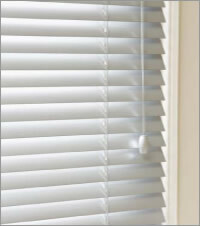 They will not warp in the heat and will also fit your patio door, French window, bay windows and sash windows perfectly. These practical blinds are available in a range of beautiful plain, metallic, hammered, perforated, striped, wood look and brushed finishes. They look absolutely fabulous and are super easy to fit. Each aluminium blind is supplied with a universal bracket for fixing, making it easy to fit to ceilings, into the wall sideways or even into the frames of your windows. Once fitted they are oh so easy to use, they have colour matched heavy duty cords to lift and drop your blind, and a crash proof corf which will lock to avoid the blind slipping when you walk away giving you a precise positioning tool. 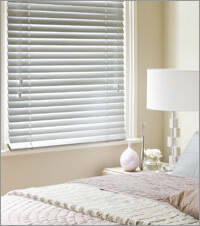 These quality blinds also come as standard with a strong and durable tubular controlling wand for rotating the slats to the exact angle you need. So pop the kettle on take a browse and congratulate yourself on finding such a fantastic supplier for your aluminium blinds. Request some free samples and when you place your order rest assured you’re going to get the very best in horizontal venetian blinds available online. Composition: Very High Quality 100% recyclable aluminium. 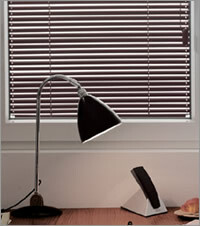 Large Blinds: * Extra wide Venetian blinds (up to 400cm) with extra-long drops are available. These are ordered at customers own risk due to their weight. They may require extra care when being raised and lowered. Metal Slat Width: Very elegant 25mm wide. Headrail: Luxury Colour matched aluminium. 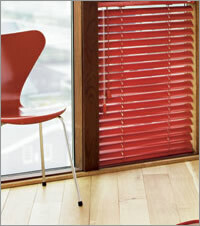 Cords: Heavy duty lift cords colour co-ordinated with the colour of the slats. Controls: Right hand or left hand controls. Operation: High quality crash proof lift and tilt mechanism for ease of use. Fixings: Supplied with all the necessary brackets & screws for ceiling, frame & side fixing. End Caps: Flush fitting for a more attractive design. 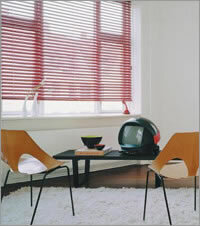 Cleaning: Dust them clean or gently wipe the blind using a damp cloth. Delivery: Approx. 5-10 working days.